Training effectively as a runner who is over the age of forty is a balancing act. On the one hand, you need to back away to some extent from the training practices that worked best for you when you were younger. On the other hand, you don’t want to back off more than necessary or else you’ll sacrifice more fitness and performance than necessary. The challenge is to make targeted modifications to your training strategy that account for what your body has lost while also fully exploiting what your body still has. In Part 1 of this three-part series on training for masters runners, I discussed one such modification: the extended microcycle. In this second installment I will share another one: block periodization. The term “block periodization” originated in the weightlifting realm, where the practice is widespread. In endurance sports, the term carries a slightly different meaning and the practice is not as widespread. As it applies to endurance sports, block periodization entails separating the volume and intensity elements of training. For example, a runner might do a block of three high-intensity workouts one week and a block of six longer low-intensity workouts the next week. The developers of block periodization did not have masters athletes in mind when they came up with the idea. Rather, they saw the practice as a way to stimulate additional fitness gains in already well-trained athletes. Specifically, they saw block periodization as a way to make training harder without making it more stressful. They presumed that elite athletes were already training as hard as they could in the traditional way, where high-volume, low-intensity interval training and high-intensity interval training are mixed. It seemed plausible that by separating these two different types of training, athletes could do more of both without necessarily doing either in excess. During high-intensity training weeks, athletes would not be limited by fatigue induced by long workouts at low intensity, and during volume weeks, athletes would not be limited by fatigue induced by high-intensity intervals workouts. A couple of recent studies conducted by a team of Norwegian researchers led by Bent Rønnestad have validated this reasoning. In one of these studies, 12 trained cyclists were separated into two groups. For 12 weeks, one group practiced traditional periodization, doing two high-intensity interval workouts and several low-intensity rides every week, while the other group practiced block periodization, doing one high-intensity workout per week for three weeks and five such workouts every fourth week. The gaps were filled with low-intensity rides such that the two groups did roughly equal total amounts of high-intensity and low-intensity training over the 12-week period. Pre- and post-testing revealed that the members of the block periodization group experienced slightly greater improvements in VO2max, power output at a blood lactate level of 2 mmol/L, and average power output in a 40 km time trial. I learned of these results when they were published in 2014. A few years earlier, I came up with the same concept independently, but instead of calling it block periodization I gave it the less catchy name “compartment training.” Another difference between my version of the idea and Rønnestad’s version is that I conceived it as a way for older runners to train as hard as younger runners but with less physiological stress rather than as a way for young athletes to train harder but without additional stress. If it’s true that separating the volume and intensity elements of training makes the same overall level of training less stressful, then block periodization can be used in either way. Having just turned 40 when I had my insight, I experimented with block periodization in my training and found a formula that worked very well. I’ve since been using it with the older runners I coach, also with good results. My block periodization formula for masters runners is not as extreme as the program Rønnestad has tested on young cyclists. High-intensity running is much harder on the muscles, joints, and nervous system than is high-intensity cycling. Cramming five-high-intensity runs into a single week is too much for any runner, especially a masters runner. I prefer to maintain a fairly even frequency of high-intensity workouts between intensity weeks and volume weeks but to make the high-intensity workouts that fall in intensity weeks more challenging. For example, a high-intensity workout in a volume week might be a 45-minute fartlek run featuring a half-dozen one-minute bursts at 5K race pace, while a high-intensity workout in a volume week might feature a set of nine, 90-second intervals at 3K race pace. Another big decision to be made when designing a block periodization training plan concerns the ratio of volume weeks to intensity weeks. Rønnestad’s studies deployed a four-week cycle, where the first week was an intensity week and the next three weeks were volume weeks. In the training of masters runners, I think this ratio should vary depending on the distance of the peak race the runner is training for and where the runner is within the training cycle. A higher ratio of volume weeks to intensity weeks (3:1) is better during base training and for runners preparing for longer races. A lower ratio (2:1 or even 1:1) is better during peak training and for runners preparing for short races. In my experience, the trickiest aspect of planning and implementing block periodization training programs is fitting in recovery weeks. Should recovery weeks fall in volume weeks or intensity weeks? The answer is, once again, that it depends. 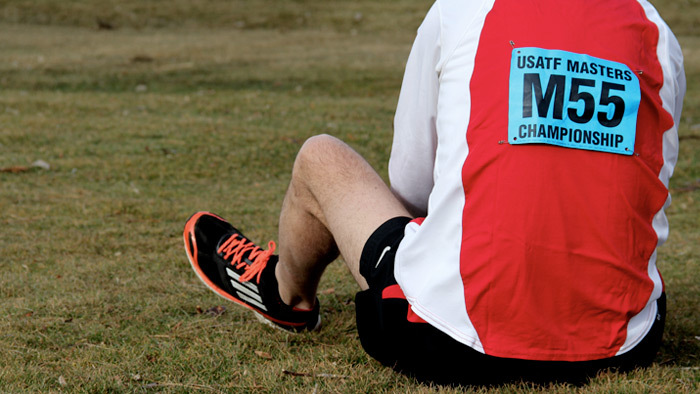 Generally, masters runners fare best when they designate every third week as a recovery week. I think it’s more important to stick to this frequency than it is to ensure that recovery weeks always fall on either a volume week or an intensity week. Either a volume week or an intensity week can easily be made into a recovery week. So the decision about how often to take a recovery week and the decision about how to balance volume weeks and intensity weeks should be made independently, and however they line up is how they line up. Here’s an example of a three-week training block where the first two weeks are volume weeks and the third week is both an intensity week and a recovery week. This training block is available as a free download to your TrainingPeaks account. At first glance, week three might appear to be no easier than weeks one and two. After all, it contains three “hard” runs (indicated with boldface), two of them quite challenging, compared to just two manageable “hard” runs in weeks one and two. But the overall training load in week three (which factors together both volume and intensity) is actually about 28 percent lower in week three than in week two, which is appropriate for recovery weeks. This is just an example, but it demonstrates that intensity weeks can indeed serve double duty as recovery weeks in a block periodization training program. Note that hard days fall every third day in this schedule. In other words, this schedule incorporates the extended microcycle strategy discussed in Part 1 of this series as well as the strategy of block periodization. In the next and final installment of this series, I will discuss a third complementary strategy: low-impact cardio cross-training.